In the rural riverside town where Joseph Elmer Ritter was born in 1892, yesterday saw the dedication of the park across from his boyhood home in honor of the Hoosier -- one of two Indianans ever to become a cardinal. The first archbishop of Indianapolis, Ritter was transferred to St Louis in 1946 after the newly-elevated Cardinal John Glennon -- the Gateway City's first Roman prince -- died in his native Ireland en route home from receiving the red hat. After the relative serenity of Glennon's 43-year reign, however, the new archbishop quickly garnered howls of protest over his order to de-segregate his new charge's Catholic schools. As Ritter explained that the crosses atop church buildings "must mean something," attempts were made from within his own fold to file lawsuits blocking the move -- a plan that quickly faded when the archbishop countered with the threat of excommunication for anyone who'd take him to court. Ritter was known as being a unpretentious person. 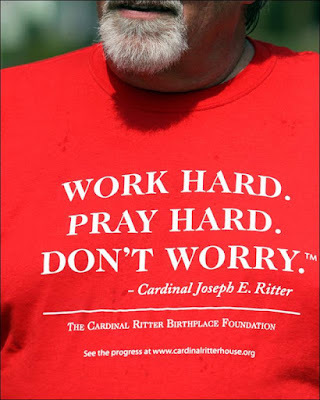 “We called him Uncle Cardinal,” said Virginia Lipps, Ritter’s niece and New Albany resident. Though she was very young — she is now 77 — when Ritter was active in the area, Lipps remembers some of what Ritter did for the community. She also remembers him just as her uncle. That kind of commonality and willingness to accept all people is the spirit the Cardinal Ritter Birthplace Foundation has tried to evoke in revitalizing his former home and park across the street. The project has been ongoing for about seven years and has cost between $550,000 to $600,000 for rehabilitation of the house, Hock said. The house is about $150,000 to $175,000 in work from completion. A large portion of the funding to save the house came from a $200,000 grant from the Horseshoe Foundation of Floyd County. The foundation also has donated another $45,000 for construction of a library at the site, news disclosed at the dedication ceremony. For the record, the schools weren't the end of Ritter's movement on race: in 1963, the cardinal declared that "that Catholics guilty of discrimination should not receive Holy Communion without first confessing their sin." After pushback from some in his pews, Rummel excommunicated three of the lead resisters.